The Journal of Race, Ethnicity, and Politics (JREP) is the official journal of the Race, Ethnicity, and Politics section of the American Political Science Association. 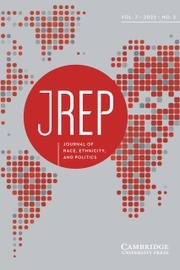 JREP highlights critical and timely research into the multiple junctures between politics and issues of race, ethnicity, immigration, and indigeneity, as well as their intersections with other axes of identity and marginalization. The journal publishes work that broadly focuses on racial and ethnic politics, from scholars across all subfields of political science and allied disciplines. The key distinguishing feature of the journal is its focus on politics, whether in a single country, across countries, or transnationally. JREP is open with respect to areas of substantive focus, with methods and approaches ranging from political theory and critical studies, to qualitative, statistical, and experimental approaches. The journal will also provide opportunities for enhanced academic engagement, including a guest column section featuring perspectives from practitioners in political and policy worlds, specialized symposia on timely topics, and blog postings and media engagement by authors, reviewers, and editors. Colonial Lives of Property. Law, Land and Racial Regimes of Ownership. Edited By Brenna Bhandar. Global and Insurgent Legalities Series. Durham: Duke University Press, 2018. 280 pp., $99.95 (Cloth). Latino Mayors: Political Change in the Postindustrial City. Edited by Marion Orr and Domingo Morel. Philadelphia: Temple University Press, 2018. 310 pp., $32.95 (Paper). Americans' Belief in Linked Fate: Does the Measure Capture the Concept?